The Sussex Wildlife Trust have taken delivery of their GBCT supported AED, one of two which will accompany their volunteer work parties. The volunteers are often carrying out nature conservation work in remote areas where, in the event of an emergency, help can be some time coming. 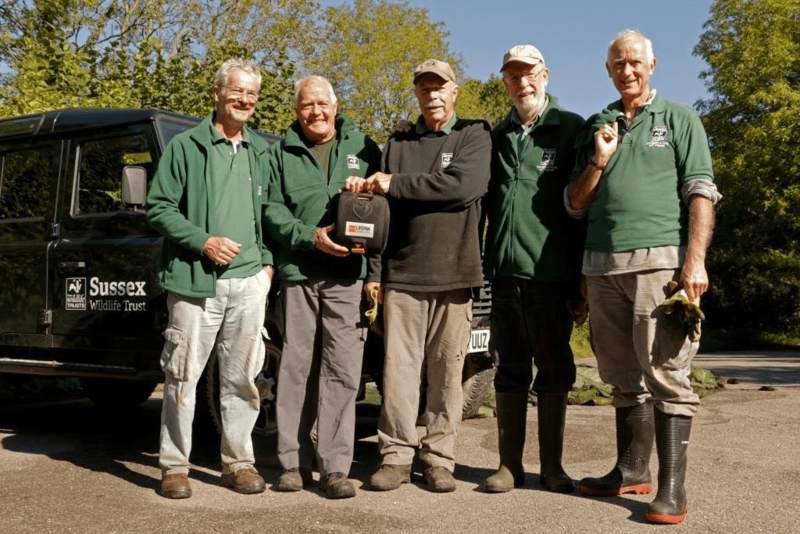 Pictured above are a group of the Wildlife Trust’s volunteers taking delivery of the AED (thank you to ©Sam Roberts/Sussex Wildlife Trust). 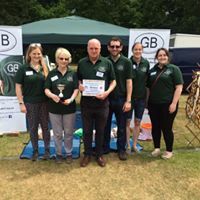 GBCT can now call itself award winning, having won the prize for the Best Charity Stall at the Englefield Green Village Fair in June 2017. Maria and Vivian Bairstow were delighted to collect the award from the Mayor of Runnymede and the Fair Committee. GBCT have attended the fair for the last two years to raise awareness of the Trust’s work, including the nearby GBCT supported Community AED, and to support this by offering first aid and AED demonstrations. The team even managed to give the Mayor and his family a quick demonstration as they judged the show! Thanks go to Katie Bairstow, Kat Stoner, Faye Wilson-Cressey and Ian Cressey who supported Maria and Vivian on the day. In July some of our Trustees were able to visit the St John’s School Leatherhead Community Holiday, to see the great work that the team from the school were doing. Visiting on the ‘painting evening’ it was clear that the young people on the holiday were having a very enjoyable and enriching time, but what pleased the Trustees most, given GBCT’s aims, was to hear from the young volunteers and their parents just how much they had learnt and developed as a result of their experience. Under the guidance of Neil Whitmore, History Teacher and Director of Community Partnership at St John’s, it was clear that the programme delivered very positive outcomes for the children attending the holiday, their parents and the volunteers themselves. As a reminder, GBCT’s grant covered the cost of a theatre visit and volunteers t-shirts, which featured Aladdin and a GBCT logo! It has been full steam ahead for the Helston Railway Preservation Society’s Juniors Day. Thanks to GBCT’s support, up to 20 young people have been actively involved in work on the railway and they are currently working on a Lamp Hut for the railway, which involves refurbishing a surplus hut from St Erth station that has been acquired from National Rail. The Society has also been able to improve links with local colleges and is hosting a student from Cornwall College for 9 months’ work experience, whilst students from Helston Community College are able to volunteer via their Duke of Edinburgh scheme. Ahoy Shipmates! Our six GBCT supported shipmates at Deptford are making tremendous progress on their courses. The last update we received was that all six had completed their bronze award and were working hard towards their silver and gold awards, covering a variety of sailing and powerboat qualifications. We hear that the young people are actively involved with the charity and are volunteering their time to support it, which is both supporting other participants and enabling them to developing a range of new skills as they get involved in fundraising, administration and maintenance. The network of GBCT supported Community AEDs continues to expand and support the provision of emergency aid. Residents in the village of Wintringham in North Yorkshire have been awarded a grant to match community fundraising towards the cost of their new AED, which increases the number of GBCT supported AEDs in the Brompton-by-Sawdon area to seven. The second grant, which is for £500 is being made to the Berkshire community of Holyport. The village is a place George knew well and he was regular visitor, often with Trustee Chris Monk, to The Jolly Gardner pub. George’s friend, who now runs the pub, is one of the community members leading the Community AED initiative. Five young people from Country Durham will be able to enhance their skills and volunteering via Street Games, thanks to a GBCT grant of £1250. Street Games aims to make sport more widely available for disadvantaged young people and to maximize the power of sport to change young lives and to change disadvantaged communities. GBCT’s grant will enable the five young volunteers to attend a three day residential, during which they’ll learn the leadership and teamwork skills needed to be sports and fitness volunteers in their own community. Young people in Bedforshire will be able to learn new cookery skills for a year, thanks to a GBCT grant of £1000 to the Families United Network (FUN). FUN aims to provide children and young adults with additional needs or disabilities with the support and leisure oportunities needed to reach their full potential. GBCT’s grant will support the delivery of cookery skills over the course of a year, covering the costs of the ingredients and hard-copy instructions for the participants. George was a keen baker so the GBCT is pleased to be able to support others develop their skills in this area and we look forward to sharing news of how the participants progress. Skills is also the theme of GBCT’s grant to Peaceful Hearts, Peaceful Minds. The community based group in Daventry has been inspired by the personal experience of its founder and will teach yoga as a new skill to young people from disadvantaged and / or vulnerable backgrounds, including those who have suffered traumas and mental health problems. GBCT’s grant of £130 is providing the equipment for a pilot with seven young women living in looked-after care. The programme will be based on a modernised version of the ‘Eight Limbs’ yoga model, which will include topical issues affecting young people such as drug / alcohol abuse, nutrition and mental health. GBCT wishes the group’s pilot every success. Nick joined GBCT as a Trustee in 2015 and has known the Bairstows for many years, having been George’s Headmaster at Woodcote House. Nick brings to the Trust a wealth of education experience, which is particularly useful to the Trustees when considering grant applications that focus upon the development of skills of young people. Nick continues to teach at Woodcote House and facilitates the annual GBCT presentations, which explain what the GBCT is and why it is significant to Woodcote House; they also include first aid demonstrations. Trustees Matthew and Ian were very grateful to Nick for imparting his teaching experience to help them channel the enthusiasm of the children participating in the talk they gave! One our supporters is already preparing for a marathon fundraising event in 2018. Kit McCrystal will be running the Edinburgh Marathon in May 2018 in aid of GBCT. We wish Kit every success and if you’d like to support him, you can find his sponsorship page on BT My Donate at: https://mydonate.bt.com/fundraisers/kitmccrystal1#donationSummary. Good luck with the training Kit! 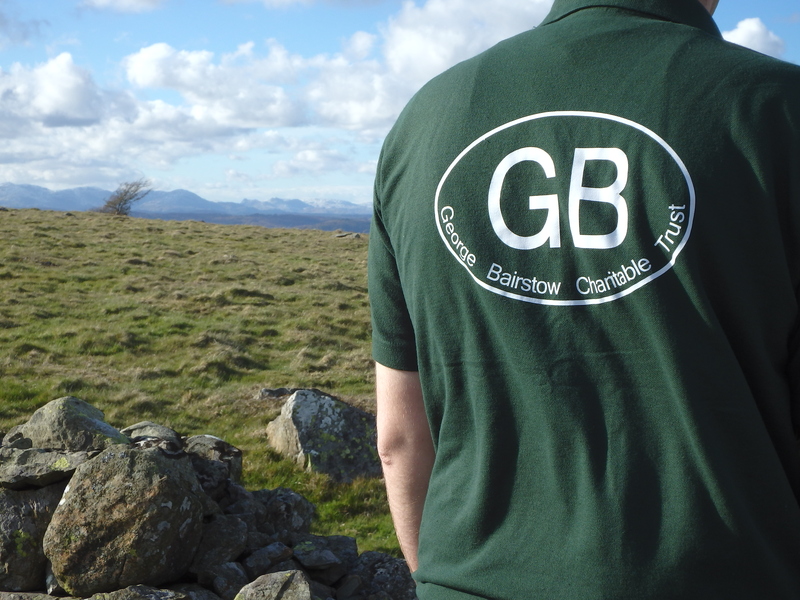 If you’re raising funds for GBCT please let us know. We’d love to be able to say thank you and support you via our social media pages.